Every time a new cooperative title is announced, and we post it, the question comes up: "How many players?" We'd say two, and someone would say why not four? We'd say four, and someone would complain it didn't have eight? We'd tell them eight and someone would say that sixteen would be better. 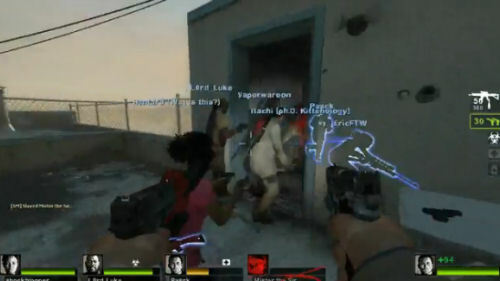 More isn't always better, and I think these two videos of Left 4 Dead 2 in action is proof of that. In them, a server is hacked to allow sixteen players to join a co-op match against the zombie horde. Not only is it chaotic and confusing, it looks downright boring after you get over the initial wow and hilarity factor of seeing six Rochelles, five Ellis', and a few Coaches. Page created in 0.4504 seconds.